Argonaut 2.0 STELTH : made to measure suit, requires BIOMAP 3D surveying. ATTENTION: The right of revocation does not exist with this product, as it is clearly tailored to the personal needs of the consumer. 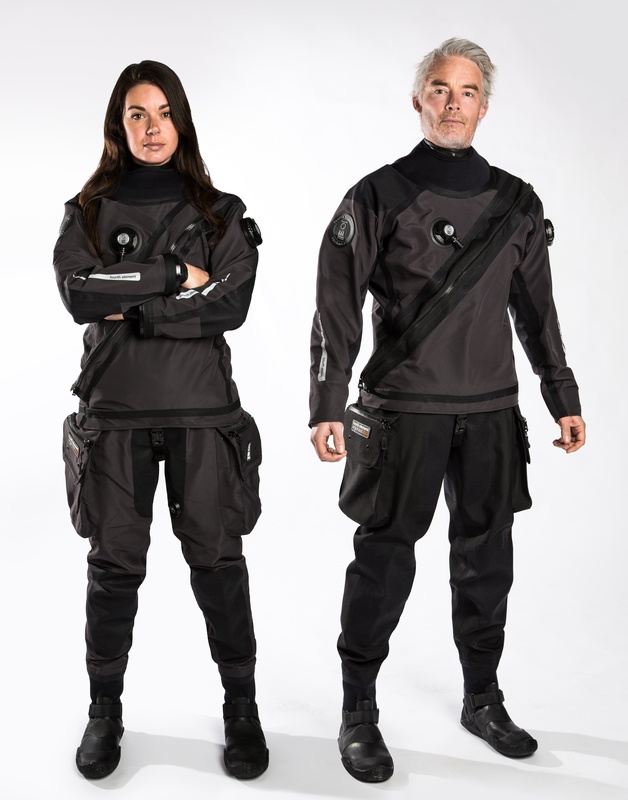 The Argonaut drysuit has been developed for the harshest diving conditions on the planet. Ergonomic design along with a telescopic torso allows maximum comfort and range of movement whether diving in conditions of extreme cold, using multiple thermal layers, or with lighter undersuits in warmer waters. Achieves European Standard EN 14225 - 2: 2005 for Drysuits in accordance with E U Directive 89/686/EEC.. The Argonaut Stealth is the newest addition to the suit line up featuring a lightweight, hardwearing and slightly stretchy trilaminate fabric that is optimised for maximum dive performance in any conditions. Argonaut 2.0 is the new pattern of the award winning Argonaut Drysuit that has been developed for the BIOMAP system. At the heart of this design process was the quest for improved mobility, stronger construction, greater streamlining, easier gas management, lighter weight and easier donning and doffing, but most importantly, the introduction of an improved women’s pattern, that fits beautifully. The size of the Argonaut stealth suits is measured by means of the BIOMAP system. Thus, the Argonaut Stealth Suit is a full-length suit that fits perfectly to you. If you would like to order this suit, we ask you to contact us or send an e-mail to schedule an appointment for a BioMap photo in our BIOMAP 3D Center. This allows us to make sure that the suit is made to fit perfectly for you. Alternatively, for example, you can create a 3D mapping at the BOOT Show in Düsseldorf. With these data (giving the identical email address), FOURTH ELEMENT manufactures the PERFECT Argonaut 2.0 STEALTH for you.